Recorded in California with Jamaican and US Reggae musicians, clean crisp contemporary roots inspired by the dub music that flowed from Jamaica in the seventies and informed by UK and European dub masters who have carried on the tradition. 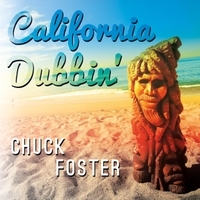 California Dubbin' is Chuck Foster's third dub release on the Catch Me Time label. A select group of players including Mike Irwin on bass, Horseman on drums, keyboard and guitars from Tony Bird, lead and pick guitar from Rextafari, Jativa on saxophone, Todd Johnson on trumpet and guest appearances from Tony Chin and Zacky Bernard, these sturdy dubs blend Jamaican roots and the experimental feel that carried dub around the world. Recorded at the Rough Sounds studio in Redondo Beach, California and mixed by engineers Mike Irwin and Chuck Foster (host of KPFK-LA's Reggae Central and author of Roots Rock Reggae: An Oral History of Reggae Music From Ska To Dancehall (Billboard Books, 1999) and The Small Axe Guide To Rock Steady (Muzik Tree/I Am the Gorgon, 2009) California Dubbin' combines the roots of Jamaican music with the easy feel free California vibe for a full serving of contemporary roots at it's best.